The wonderful Good Purl Gone Bad has nominated us for a Liebster blog award! Hurrah! Now I'm not entirely sure what it involves exactly, but there were some questions to answer, so here goes! Where do you find inspiration outside of the blogosphere? Generally from Jumble Jelly, where I work in the shop one day a week and teach knitting and spinning classes. I also attend the Wednesday evening knit and natter, which is always a fabulous source of inspiration. Chatting to the customers about what they are making, or planning to make, watching colour combinations and seeing works in progress... What could be better inspiration? What book would you recommend to someone starting out in dress-making? I have a couple of books, but I've mostly just practiced sewing in straight lines, and taken a couple of the sewing workshops with Alexa at Jumble Jelly. So I'm afraid I don't have any recommendations! What’s your favourite sewing gadget other than machine, overlocker and iron? The seam ripper!!! In fact, I've misplaced it at the moment, and its making me feel a bit shakey! Where do you sew? Or where would you like to sew? 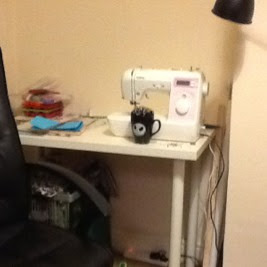 This is a corner of my dining room, dedicated to my sewing machine. The boxes underneath the table are full of fabrics and patterns. To cut out i use the living room floor which is quite large! If you had a guaranteed new start in a new craft or hobby (with time, talent, supplies etc) which would you choose to learn? Oh wow, I already knit, crochet, spin and sew... I've always wanted to try lace making, it looks fascinating and can produce so wonderful items! And then I could use them to edge things! What’s your favourite fabric to work with? I'd like to try a dress for myself, and I'm booked on to a new workshop at Jumble Jelly to make a tunic dress, so watch this space! Who do you like to sew for? Me!! Haha, since I live on my own, and have no small people... Me! What sewing magazines, if any, do you read? I don't I'm afraid, I'm so terribly boring! 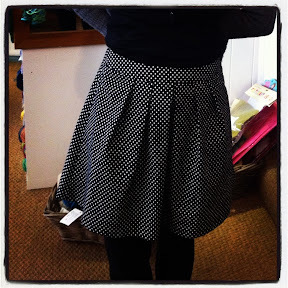 What sewing processes are easier than you expected? Now I'm supposed to tag some other bloggers and ask some questions of my own... But I'm going to be even more boring and say I don't really read blogs, just the ones that pop up on my Ravelry friends feed when I remember to check it!